Cabinet members at Thanet council have agreed a budget for 2019-20 that includes a 2.99% hike in council tax and savings of £1.3 million as well as £3million earmarked for refurbishment or new authority offices. The cuts come amid falling income from Government. The Revenue Support Grant to Thanet from central government is estimated to be £97,000 for the 2019-20 financial year. In 2018-19 it was £809,000 and in 2017-18 the grant stood at £1.446m. This is compared to £6.636m in 2013-14. The New Homes Bonus allocation to Thanet has been slashed to £600,000 – a whopping £400,000 lower than the 2018-19 allocation. A Kent and Medway bid to be a pilot for 75% business rates retention in 2019-20 failed meaning the council will be part of a Kent pool receiving 50% business rates retention. There has also been a cut of £78,000 in the allocation from the Government towards housing benefit administration. The council will receive a one-off payment of £76,000 in redistributed business rates. Thanet needs a budget amount of £16.6 million for the coming year. Measures to raise funds include the 2.99% council tax rise, which will raise £ 43,763.27. The hike will mean a Band D home will pay £233.19 for Thanet council’s share of the annual council tax, an increase of around £6.75. Funds will also be raised through fees and charges, which were agreed in November, such as costs for parking, burials and waste disposal. There will also be a continued sell-off of council assets, currently estimated to be worth some £244 million. The council is hoping to raise £5.1million through asset disposal towards the 2019-20 budget costs. There will also be a review of public toilet provision, pavilions and shelters. If a ferry service contract for Ramsgate Port is not signed by the end of January a whopping £500,000 of planned investment will be cut along with a further £130,000 savings, totalling £630,000 (or £730,000 in a full year). There will also be ‘efficiencies’ made within East Kent Housing which is responsible for local authority homes in Thanet, Shepway, Dover and Canterbury. However, there are also plans for spending which include £1.2million on Ramsgate Port berths 4-5 so that Brett Aggregates, which carries out concrete batching at the site, can use bigger vessels. Some £3million is also earmarked for either refurbishment of Thanet council’s offices in Cecil Square or possibly the purchase of a new building. 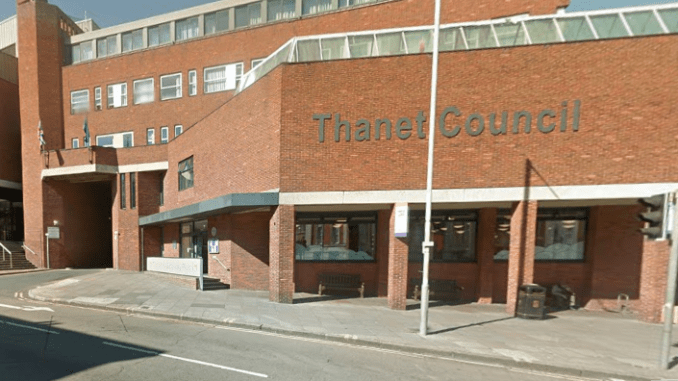 Thanet council will also set aside £200,000 to cover bad debts which are forecast to grow due to increased rent arrears and the effects of Universal Credit. Social and affordable rents will be decreased by 1% in line with the government rent guidance. The average rent is currently £80.36, with an average decrease of 77p per property. Spending on new build properties or the buying of properties has a reserve of £5.37m. The council’s reserve fund stands at £2m but is estimated that this may be spent during 2022-23, if the future funding gap is not addressed. Cllr Gregory said: “The draft budget is being recommended to ensure it can contribute towards meeting the council’s priorities and delivering key services to local people. The council has experienced a significant reduction in funding received from Central Government – £5m reduction over the past five years. The budget recommendations will go to Full Council on Thursday 7 February for approval. jUST THINK HOW LUCKY YOU ARE , LOVELY WARM OFFICES , GOOD FAT PENSION AND A ROOF OVER YOUR HEADS . A LOT OF PEOPLE WHO SLEEP ON THE STREET WOULD BE ONLY TOO PLEASED TO STAY THERE OVERNIGHT . SO DON’T TAKE THE PISSAND PAINT YOUR OWN OFFICE AND DON’T SPEND THE MONEY AS THE NOT SO WELL OFF AS YOURSELVES AND FIND OUT HOW TO SURVIVE AUSTERITY , LIKE US. Don’t TDC Tories know there is a housing crisis in Thanet! Spending our tax money on refurbishing the council offices when hundreds if not thousands are living in sub standard housing, with no future to look forward to except to pay rent to greedy private landlords for ever! If they used the money to rehouse people in decent social housing, they might get my vote in the next local elections, but that will never happen will it! This is disgusting. “There will also be a continued sell-off of council assets, currently estimated to be worth some £244 million. The council is hoping to raise £5.1million through asset disposal towards the 2019-20 budget costs.” Selling off assets, cutting services… Our councils and our public services are being starved by central government, and it leads to more suffering and more deprivation in areas that need it the most. These cuts will increase inequality. It’s a disgrace. If the TDC building is that bad then it was badly built / designed to start with.The building cannot be that old to need an upgrade its about time TDC stopped spending our money on themselves. Heads-up for the morons saying that the stairs can be used when the lifts are out of action: disabled people can’t use stairs! They could get a stairlift for a grand or less to service the disabled, the obese & the lazy. Margate is number one for dog mess, do you really want to take that accolade away? Instead of wasting monies on re vamping council offices, use the additional funds to provide accommodation for our many homeless in Thanet! TDC is at it again – looking after themselves !!! Instead of wasting £3 million of tax payers money on decorating use it to maintain the district – get your priorities in order. So what if the lifts break down- are there no stairs – exercise is good for you especially if you are sitting behind a desk. Talking about increases to council tax but cuts for service users again, including more public toilets when we actually need them to stay open for the tourists as well as residents. Then stating they are going to give Brett aggregates a helping hand by spending £1.2 million on the berths at Ramsgate harbour (anything to do with the dredging going on?) and flashing the cash on repairs to the council offices to make them more comfortable or purchasing a new building! Wow, you couldn’t make it up! We are all in it together, oh, except the rich Tories in charge. With an overspend of over a million, TDC think it is OK to spend 3 Million on refurbishing or renewing the TDC council offices. Can we be informed of why this is necessary ? What are our councillors thinking of to agree to this? Before TDC spend £1.2 Million on Port Ramsgate berths 4-5, to help Brett’s use bigger vessels, (which probably won’t be able to get into the harbour anyway, as they will meet the same problems as large ferries would, but it falls on deaf ears at TDC! ), I would like to know why Brett’s are still there in the first place, as that area is covered by a marine protection order, which has seemingly been ignored by TDC for years now. Also, if TDC continue to ignore the Environmental Agency issues surrounding the port, are Brett’s going to pay anything towards it, or are they getting away without paying anything, another benefit for Brett’s to add to the pittance they pay already, causing no profit at all for TDC, which in turn, affects all of us! It seems that we and TDC are paying for Brett’s to be there, even though the residents don’t want them! Is there a business brain anywhere at Cecil Square? Enough comments have been made already about the millions TDC intend to spend (waste?) on their own comfort! I won’t add to them, apart from to,say I am disgusted! In 2013-14 £6.636m was received as Revenue Support Grant and by 2020-21 that will be 0, this is money we still pay in taxes to the Treasury that Central Gov is no longer giving to the Council. Anyone had a decrease in their tax since 2013-14? No is the answer, we are now going to pay twice. Got my Tax statement yesterday from HMRC showing where my tax and NI is spent, 4th highest thing is central Gov debt interest payments, who said the Tories are the fiscally responsible party? If you have been in the Council offices you will see they are quite nice. They should stop wasting money. And get on with it.